It’s not a full two days between games, but the Thunder will take the 36 hours it has had at home to rest, sleep and prepare for a Super Bowl Sunday afternoon clash with the Los Angeles Lakers. For the third time this season these two squads will do battle. The first two meetings both resulted in Thunder wins. Rookie point guard Lonzo Ball didn’t play in either match, and won’t play in this one as well. Fellow youngster Brandon Ingram is listed as questionable, but the Lakers still have a variety of weapons that can hurt the Thunder on defense, particularly in transition. Kyle Kuzma and Larry Nance Jr. are both tall, strong, physical high fliers at the wing positions that can get out and run in the open floor to finish above the defense. With Julius Randle and Brook Lopez scoring efficiently on the inside and Kentavious Caldwell-Pope spotting up behind the three-point arc, the Lakers will try to break the Thunder down on the perimeter to score efficiently. The Thunder has to be in position to help in case of dribble penetration, but also needs to stay attached to their assignment out at the three-point stripe. “Really what it comes down to is we have the right intention of trying to help but it’s just the awareness,” forward Paul George said. Fatigue reared its head on Friday night as the Thunder’s tank read empty in the final game of a stretch of five games in seven nights in three different time zones, having flown nearly 5,000 miles in a span of seven days. With a slight chance to catch its breath, the Thunder hopes that every aspect of the game that faltered in the second half against the New Orleans Pelicans will be back up to standard against the Lakers. One way the Thunder can help itself is by controlling one of the most critical areas of the game – fouling. If by staying aggressive by attacking the paint and generating 2-on-1 or 3-on-2 situations, the Thunder is much more likely to draw fouls. The earlier in a quarter, the better because as soon as the Thunder gets its opponent to four team fouls the dynamic of how physical the defense plays can change dramatically. Especially if this one is close heading into the start of the fourth quarter, both teams will need to be mindful of their hands and positioning. - In the absence of Andre Roberson, there’s been a natural uptick in playing time for other Thunder wings. The mandate for those players is not to try to emulate Roberson, but to be the best possible version of themselves on the floor. One of those players has been Alex Abrines, the three-point maestro who has hit 8-of-15 shots over the past two games, including 6-of-13 three-point attempts on his way to 13 and 14 points respectively in 29 and 24 minutes against the Denver Nuggets and New Orleans Pelicans the past two games. The reason Abrines has been able to stay on the floor hasn’t just been his offense. Actually, the Spaniard’s defense has been solid both on the ball and in help side rotations. “Alex is always lethal from the perimeter with catch and shoot,” George added. “Over these couple of games he’s been aggressive playing downhill, playing toward the basket as well." 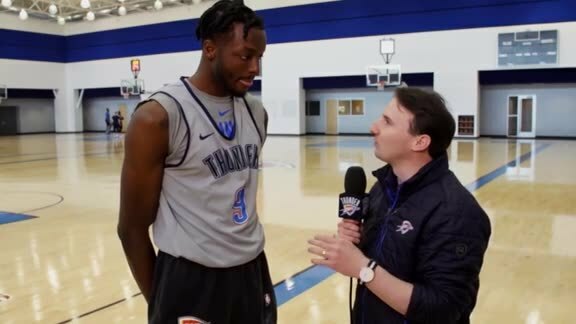 - Another player who has stepped to the plate has been Jerami Grant, who has been equally effective, but in a different way than his counterpart Abrines. Against Denver, Grant went 6-of-9 from the floor and managed to rack up nine free throw attempts on his way to a season-high 18 points by being aggressive and attacking the rim off the dribble and in transition. On Friday versus the Pelicans, Grant was similarly effective, this time with early post ups against smaller defenders and baseline attacks off the bounce. He didn’t get any foul shots, but he went 6-for-7 on his way to 12 points while cleaning up the glass with a career-best 12 rebounds. In order to be a factor in closing-time lineups, Grant will have to be a threat to score, play within the Thunder’s switch-heavy schemes and finish off possessions with strong rebounds.